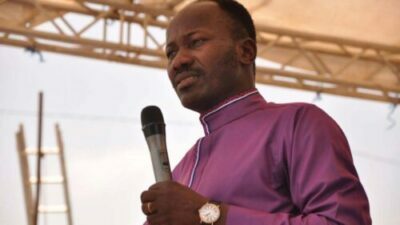 General Overseer of the Omega Fire Ministries, Apostle Johnson Suleman, has responded to a video of him prophesying that the Peoples Democratic Party, PDP, would emerge winner of the just concluded Ekiti governorship election. Clearing the air on the prophecy, Apostle Suleman took to his Twitter page on Monday morning, sharing the video. He explained that the video was done weeks before the election. “That Video making the rounds was done three weeks ago before the Ekiti election,” he said.